In the spirit of March Madness, Sean’s Humble Opinionwould like to introduce the 80’s Action Movie Bracket Contest. See attached bracket featuring some of the greatest action movies of the 80’s. Fill out the bracket and return to seanshumbleopinion@gmail.com for your chance to win. The winner will be announced on the Season Finale of Sean’s Humble Opinion. Be sure to print plenty of copies and pass them out to your friends as well!!! 80’s ACTION BRACKET – CLICK HERE! In the spirit of March Madness, Sean’s Humble Opinion would like to introduce the 80’s Action Movie Bracket Contest. See attached bracket featuring some of the greatest action movies of the 80’s. Former U.S. Army Ranger Mike Banning (Gerard Butler) is now a Secret Service agent assigned to head the Presidential Detail. He maintains a personal, friendly relationship with President Benjamin Asher (Aaron Eckhart), First Lady Margaret Asher (Ashley Judd) and particularly their son Connor Asher (Finley Jacobsen). On a drive from Camp David on the snowy night of December 22, 2010, the car transporting the President and First Lady crashes; Banning saves Benjamin, but Margaret dies. Eighteen months later, Banning works at the Treasury Department within eyesight of the White House, and wants to return to being a Secret Service agent on the Presidential detail, but Asher does not allow this as Banning brings up memories of the night Margaret died. During a meeting at the White House on July 5, 2012 between Asher and the South Korean Prime Minister, a Korean group leads a guerrilla attack against the White House. 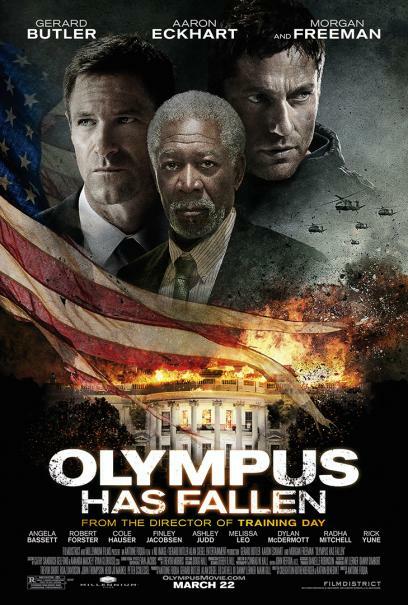 The assailants include an airplane attack against Washington D.C. by a stolen USAF AC-130 gunship, land forces disguised as citizens which initiate a car bomb attack, traitors within the security detail of the South Korean Prime Minister, and the current head of the Prime Minister’s Detail, Dave Forbes (Dylan McDermott), who reveals himself to be a traitor. The assault ends with the Koreans capturing the White House and holding the President and several top officials hostage in the White House bunker, where they kill the South Korean Prime Minister. Agent Roma (Cole Hauser) informs Lynne Jacobs (Angela Bassett), the head of the Secret Service, that “Olympus has fallen” before getting killed. The group is lead by Kang Yeonsak (Rick Yune), an ex-North Korean terrorist who appears to hold allegiance to neither North nor South Korea but to the concept of a unified Korea by any means. Kang has two goals. The first is to use the President as a hostage to force the United States to withdraw from Korea, allowing the civil war to finish. Second, he seeks to detonate all United States nuclear bombs in their silos and destroy the United States as revenge for the death of his mother, victim of an American landmine, and his father who was executed. To accomplish this, he requires the access codes to a system in the bunker called Cerberus, which are held by three top United States officials within the bunker, including the President. Asher orders the other two officials to reveal their codes to save their lives, certain that he will not give up his code. During the assault, Banning sneaks into the White House and is the only defending survivor. He gains access to the President’s satellite ear phone, which he uses to maintain contact with Allan Trumbull (Morgan Freeman), the Speaker of the House who is now the acting President. His first act is to save Connor, who Kang plans to use to force Asher to reveal his Cerberus code. He finds Connor hiding in the walls thanks to the training Banning had given him, and sneaks him out of the White House through the vents. Banning then goes on a mission of obtaining information on the assailants and reducing their numbers. He also kills Forbes, who has realized his error and repents before dying, helping Banning by reporting him dead to Kang. When Kang tries to execute Secretary of Defense Ruth McMillan (Melissa Leo), Banning is able to save her and take out several more of Kang’s men in the process. With Kang’s forces now greatly dwindling, he fakes his own death, as well as Asher’s, by sacrificing several of his men and the other remaining hostages. Kang, Asher, and the few remaining terrorists remain in the bunker, unknown to the outside world. Kang eventually cracks Asher’s code and activates Cerberus as Banning realizes that his apparent suicide was faked. As Kang attempts to escape Banning kills off the remaining terrorists and manages to kill Kang in a knife fight by stabbing Kang in the head, before disabling Cerberus with the assistance of Trumbull, and one of Trumbull’s team members who gives him the deactivation codes. Banning and Asher safely escape the White House, the United States begins repairing the damage to Washington D.C. and the White House, with Banning once again becoming head of the Presidential Detail. An airing of Sean’s Humble Opinion originally broadcast March 22, 2013. 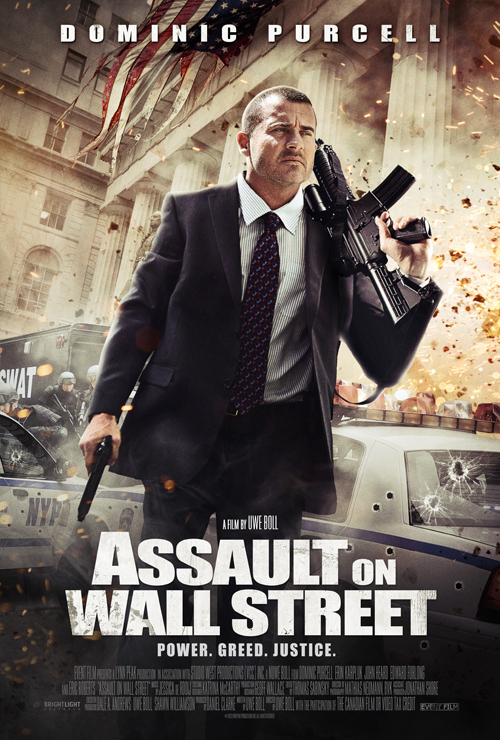 Assault On Wall Street…Might Be My First Uwe Boll Movie! In My Humble Opinion: Assault on Wall Street might be my first Uwe Boll movie ever. I’ve never sat through one of his movies and know he’s widely considered the Ed Wood of the 21st century. Ed Wood – Considered the worst director in film history. Anyway, I am a fan of Dominic Purcell…at least I was back when he was on Prison Break so I might give this movie a watch. Originally titled Bailout: The Age of Greed; Assault on Wall Street follows a man whose life is ruined at the hands of the financial meltdown in the country (at least they made him relatable) and decides to pull a Michael Douglas Falling Down on Wall Street. I’m skeptical given Uwe’s track record, not to mention the fact that Edward Furlong is listed as a co-star. You can say that my expectations are low, which from what I’ve heard about Uwe Boll movies, is exactly where they should be. In My Humble Opinion: Travis couldn’t be more right on this point. I know I own about 3 or 4 different versions of the original Star Wars trilogy so I feel his pain…enjoy. Before we begin, how about a little introduction? My name is Travis and besides being the co-host of the popular local access show, Sean’s Humble Opinion Live!, Sean and I have been friends for a long time. We’ve collaborated on a number of projects over the years and now he has been good enough to give me a little space amidst his own humble opinions to air some of my own delusional, half-formed notions, mostly a place for me to complain about things in all likelihood. So, for the purposes of this blog, I am Chewbacca to Sean’s Han Solo, Keith Richards to his Mick Jagger…the Oompa Loompa to his Willy Wonka. Now, let’s get started. Finding examples of the greed exhibited by the entertainment industry is about as simple as finding a DUI on Lindsay Lohan’s driving record, but one practice in particular has been blanching my tomatoes. Yesterday was the long-awaited release of the first installment of Peter Jackson’s film adaptation of J.R.R. Tolkien’s classic fantasy work, the Hobbit, on Blu-Ray and DVD. Now, for the record, I am a life-long, Lord of the Rings dork and the Hobbit has been my favorite book since I was 10 years old. In any event, I caught the Hobbit: An Unexpected Journey in theaters around Christmastime and was fairly determined not to like it. Turns out it was okay. I had a few notes (that’s another blog entry entirely), but overall it was an enjoyable film experience. I figured I’d buy the Blu-Ray when it came out, no problem, but a little research quickly revealed that New Line is already planning an “extended edition” for the Christmas buying season. Besides the face-slapping question of how much more can Peter Jackson really wring out of Tolkien’s text for an extended version, this other edition presents a problem for old Travis. After showing my son the Rankin & Bass animated version of the Hobbit from 1977, on top of the relentless advertising campaign for the new movie, he’s currently Hobbit-obsessed and wants to see the live-action movie some kind of bad. So, do I pony up the money for the regular old theatrical version, knowing that it lacks content that will be available in a few months or just wait it out for the extended version? Well, try making a 6 year-old wait 9 minutes for something, much less 9 months. So, I bought it. And when the extended version comes out, I’ll probably buy that too. I can’t decide which is worse; the complete disregard the movie industry has for me as a consumer or my utter stupidity for continuing to fork over my hard-earned for essentially the same damn thing over and over and over again. I already own 3 copies each of the Lord of the Rings movies, so what’s the big deal, right? Thank god I’m not a ‘serious collector’ as I also found that several retailers had their own, “exclusive releases” featuring bonus LEGO figures or collectible books or hobbit DNA or whatever New Line’s marketing department could strap to the box. If somebody is obsessed enough, they could probably be on the hook for 10 copies of the same movie under the pretense that each copy is “collectible” in its own way. Hate to break it them, but in 10 or 20 years, Rick Harrison and the Pawn Stars will not be helping them to triple their investment in Hobbit Blu-Rays. Nope, in a few years, the conglomerate of movie studios and electronics manufacturers will have forced a new format down our throats that puts Blu-Ray to shame. And I’ll be buying yet more copies of my favorite movies. Thank you, sir, may I have another.